Part of the joy of being a diverse community is the celebration of feast days like Easter. 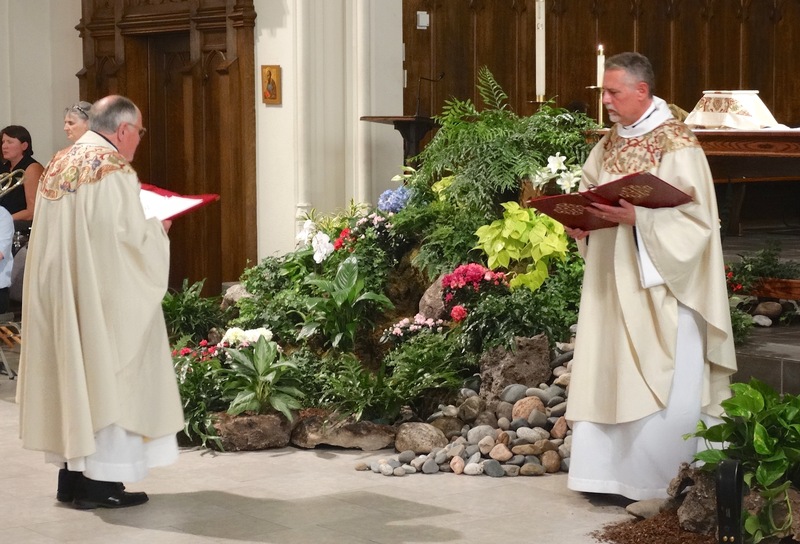 Combining traditions of both Lutheranism and Roman Catholicism, Saint Paul has crafted several services that connect participants to rituals past and present, while forever staying true to a theology of love, inclusion, and understanding. The great and Holy Drama begins on Palm Sunday – also called the Sunday of the Passion. Here we remember Jesus’ humble entry into Jerusalem, itself a bit of street theatre, and hear the story of Christ’s death read from the pulpit. The word “Maundy” itself comes from the Latin word, mandatum, meaning commandment. On Maundy Thursday (also known as Holy Thursday) we remember in word and in action Jesus’ commandment to “do this.” There are two principal actions in the Thursday liturgy that were commanded by Jesus to do. The first is to wash one another’s feet – which is a symbolic action meant to represent serving one another in the most humble ways possible. The second is the institution of the Lord’s Supper: in the Words of Institution, we hear Jesus say, “Do this for the remembrance (or remembering) of me.” People are free both to have their feet washed and wash the feet of another person. The Holy Eucharist is then celebrated and the altar stripped. The action continues Good Friday with the reading of the death and burial of Our Lord – the Passion – from St. John, followed by the Adoration of the Holy Cross. Even after our silent departure to the tolling of the death knell, the liturgy is not finished, but continues with the Easter Vigil. Easter Vigil is liturgical drama at its best! We begin outdoors with the lighting of the New Fire and then process by candlelight into the darkened nave of the church where, still by candlelight, we hear the great stories of our faith, beginning with creation. Next, gathering around the font, we remember the promise given to us in Holy Baptism. This is followed by the announcement of Christ’s Resurrection at which time the lights of the church are raised, organ and bells sound forth in joy and we sing together the Hymn of Praise. This is followed by the celebration of the Eucharist, the first Eucharist of Easter. At the close of the Vigil, for the first time in the Three Days, the benediction is given and the Liturgy of the Great Three Days comes to its close! Sunday, of course, we celebrate the Risen Christ who returns to the world not with words of condemnation against fickle humanity (of which we are a part) for the death of Christ, but with words of peace for the whole world! All of these liturgies, of course, depend upon you and your presence. It is you who sing and pray; it is you who bring the Holy Spirit into the midst of the congregation; your presence is a gift to those around you. All are welcome at any service! Parking information for all visitors can be found here.